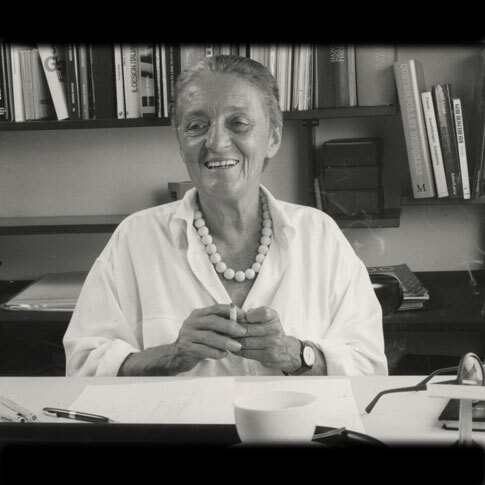 Italian architect and industrial designer Anna Castelli Ferrieri studied architecture at Milan Polytechnic, and in 1943 married Giulio Castelli, a chemical engineer who founded Kartell to make high-quality designer objects from plastic in 1949. From 1946 to 1947 Anna Castelli Ferrieri was editor of the architecture magazine Casabella Costruzioni and at the same time founded her own architecture practice that collaborated with the architect Ignazio Gardella on projects in Milan, Turin, and Genoa. Other important projects include the Kartell company headquarters in Binasco and buildings for the car maker Alfa Romeo in Arese. From 1965 onwards, she was involved in designing objects for Kartell and other Italian manufacturers. At Kartell, experimenting with different kinds of plastic, she designed many innovative objects including the Componibili stackable container elements made of ABS plastic, and the Castelli Ferrieri 4822/44 stool that was the first successful combination of metal and polyurethane at Kartell.